The agreement specifies the authority and responsibilties of the practice manager for the administration and business management of the dental practice. Duties of the manager include arranging for equipment, supplies, non-dentist personnel, provision of office space, financial record keeping, and patient billing and collection, among other duties. 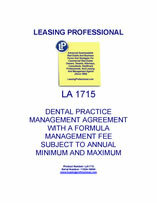 This Dental Practice Management Agreement (this "Agreement") is being executed effective __________, 20__, among Advanced Dentalcare, P.L.C., a ____________ professional limited liability company ("Advanced"), its wholly owned subsidiaries, Advanced Periodontic Specialists, P.L.C., Advanced Oral Surgery Specialists, P.L.C., and Advanced Endodontic Specialists, P.L.C., all ____________ professional limited liability companies (the "Subsidiaries," and with Advanced, collectively "Dental Provider"), and Competent Dental Management, Inc., a ____________ corporation ("Management Company"). A. Dental Provider operates dental practices providing dental services to the general public in and around the __________, ____________ area through individual dentists who are licensed to practice dentistry in the State of ____________ and who are employed or otherwise retained by Dental Provider. B. Management Company is engaged in the business of providing assets, personnel, and services to dental practices, other than such services as are directly related to or would improperly influence the provision of dental care or the practice of dentistry. Management Company’s services are intended to permit the dentists in such practices to focus their efforts primarily on rendering quality dental care. C. Dental Provider desires to focus its energies, expertise and time on the practice of dentistry and on the delivery of dental services to patients. To accomplish this goal, Dental Provider desires to engage Management Company to provide such services as are necessary and appropriate for the day-to-day administration of the non-clinical aspects of Dental Provider’s dental practice, and Management Company desires to provide such services to Dental Provider, all upon the terms and subject to the conditions set forth in this Agreement. Capitalized terms used in this Agreement but not otherwise defined herein shall have the respective meanings given those terms in the attached Exhibit A, which is incorporated herein by reference. 2.1 Appointment. Dental Provider hereby appoints Management Company as its sole and exclusive agent for the performance of the Services, and Management Company hereby accepts such appointment, subject at all times to the provisions of this Agreement. 2.2 Authority. Management Company shall have all power, authority, and responsibility reasonably necessary to provide the Services and carry out Management Company’s other obligations under this Agreement. Without limiting the foregoing, Management Company shall have the authority to provide the Services in any reasonable manner Management Company deems appropriate to meet the day-to-day requirements of the business functions of Dental Provider. Subject to Article III of this Agreement, Management Company is also expressly authorized to negotiate and execute on behalf of Dental Provider contracts that do not relate to the provision of Dental Care or the employment of licensed professional personnel. Dental Provider shall give Management Company thirty (30) days prior written notice of Dental Provider’s intent to execute any agreement obligating Dental Provider to perform Dental Care or otherwise creating a binding legal obligation on Dental Provider. Unless an expense is expressly designated as a Management Company Expense in this Agreement, all expenses incurred by Management Company in providing Services pursuant to this Agreement shall be Clinic Expenses. 2.3 Patient Referrals. The Parties agree that the benefits to Dental Provider hereunder do not require, are not payment for, and are not in any way contingent upon the referral, admission, treatment, or any other arrangement for the provision of any item or service offered by Management Company to patients of Dental Provider in any facility, laboratory, or dental care operation controlled, managed, or operated by Management Company. Likewise, the Parties agree that Management Company is not engaging, does not intend to engage, and is not required to engage in any referrals of patients to Dental Provider or any similar activities, and neither the Service Fee nor any other amount paid to Management Company by Dental Provider pursuant to this Agreement is being paid as consideration for or in connection with any such activities. 2.4 Internal Dental Provider Management; Decisions Regarding Service Agreement. Matters involving the tax planning, investment planning, and internal management, control, or finances of Dental Provider, including without limitation the compensation of dentists employed or retained by Dental Provider, shall remain the sole and exclusive responsibility of Dental Provider and its shareholders. The operations of Advanced and the Subsidiaries, as Dental Provider under this Agreement, shall to the extent practicable be treated as one operation for purposes of this Agreement, including without limitation for purposes of budgeting. Advanced and the Subsidiaries shall be jointly and severally liable for all of Dental Provider’s obligations to Management Company under this Agreement. However, Advanced shall have the sole responsibility and authority for all decisions, consents, appointments, and other actions (hereinafter simply "actions") to be made, taken, or given by Dental Provider pursuant to or in connection with this Agreement, and each Subsidiary hereby irrevocably appoints Advanced as such Subsidiary’s attorney-in-fact and agent, with full power of substitution, to take all such actions without any further involvement of such Subsidiary. All such actions shall be binding on the Subsidiaries, and Management Company shall have the absolute right to rely on all such actions taken by Advanced. 2.5 Practice of Dentistry. The Parties acknowledge and agree that: (a) Management Company is not authorized or qualified to engage in any activity that may be construed or deemed to constitute the practice of dentistry; and (b) notwithstanding anything in this Agreement to the contrary: (i) Dental Provider, through its dentists, shall be solely responsible for and shall have complete authority, responsibility, supervision, and control over the provision of all Dental Care and that all Dental Care shall be provided and performed exclusively by or under the supervision of dentists as such dentists, in their sole discretion, deem appropriate, consistent with applicable law; (ii) Management Company shall not have or exercise any control or supervision over the provision of Dental Care; and (iii) to the extent any act or service required of Management Company under this Agreement is reasonably likely to be construed by a court of competent jurisdiction or by any applicable governmental agency to constitute the practice of dentistry, the requirement to perform that act or service by Management Company shall be deemed waived and unenforceable. For purposes of this Agreement and as the context permits, the term "dentist" shall be deemed to include those individuals licensed by the ____________ Board of Dentistry to practice general dentistry or a dental care specialty such as orthodontics, endodontics, periodontics, prosthodontics, pediatric dentistry, oral surgery, public health dentistry, and oral pathology.